There are 6 Memory Care Facilities in the Maumelle area, with 1 in Maumelle and 5 nearby. The average cost of memory care in Maumelle is $5,375 per month. This is higher than the national median of $4,650. To help you with your search, browse the 11 reviews below for memory care facilities in Maumelle. On average, consumers rate memory care in Maumelle 4.3 out of 5 stars. Better rated regions include Little Rock with an average rating of 4.4 out of 5 stars. Caring.com has helped thousands of families find high-quality senior care. To speak with one of our Family Advisors about memory care options and costs in Maumelle, call (855) 863-8283. Maumelle is a peaceful community with 18,000 residents that sits just north of Little Rock on the Arkansas River. Maumelle's close proximity to the state's capital provides access to some of the best memory care facilities in the state for those living with Alzheimer's disease or another type of dementia. Seniors make up about 14 percent of the Maumelle's population, and there are several care options available in Alzheimer's Special Care Units (ASCU), which are contained within Assisted Living Facilities. Families concerned about the safety of seniors within assisted living facilities in Maumelle should be pleased to learn that the city has low rates of crime. On a scale of one to 100, with lower rankings being better, Maumelle's violent crime rating is only 11. Most seniors in the community a calm, safe day-to-day life. Maumelle has a humid subtropical climate with hot summers and cool winters with occasionally large temperature fluctuations. The city gets about 50 inches of precipitation per year, making it one of the wettest parts of the country. Maumelle has an air quality rating of 42, which is well below the average for the country. Due to hazardous contaminants in the local air, seniors and their families might want to ask staff about measures they have in place to protect the respiratory health of their residents. The cost of living in Maumelle is just 2 index points higher than the national average. Groceries and healthcare expenses are quite a bit below the national average. Maumelle tends to have higher costs than the cities and towns that surround it. Income obtained from social security is exempt from taxes in the state of Arkansas. Military retiree benefits, VA benefits and part of IRA distributions are also exempt. This helps families afford quality memory care solutions. Memory Care costs in Maumelle start around $5,375 per month on average, while the nationwide average cost of memory care is $4,799 per month. It’s important to note that memory care rates in Maumelle and the surrounding suburbs can vary widely based on factors such as location, the level of care needed, apartment size and the types of amenities offered at each community. Maumelle and the surrounding area are home to numerous government agencies and non-profit organizations offering help for seniors searching for or currently residing in an assisted living community. These organizations can also provide assistance in a number of other eldercare services such as geriatric care management, elder law advice, estate planning, finding home care and health and wellness programs. To see a list of free memory care resources in Maumelle, please visit our Assisted Living in Arkansas page. 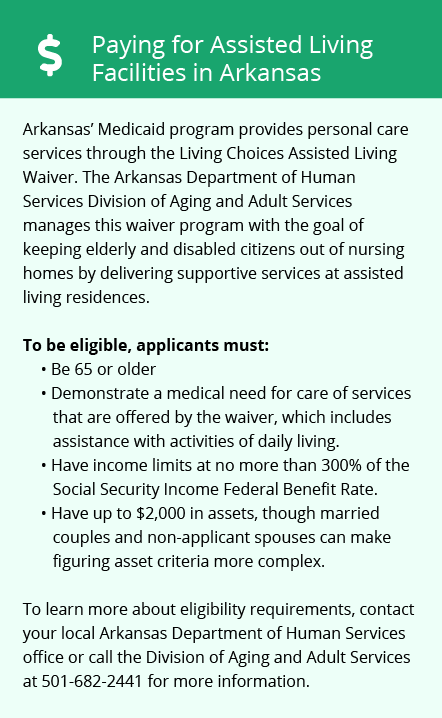 Maumelle-area assisted living communities must adhere to the comprehensive set of state laws and regulations that all assisted living communities in Arkansas are required to follow. 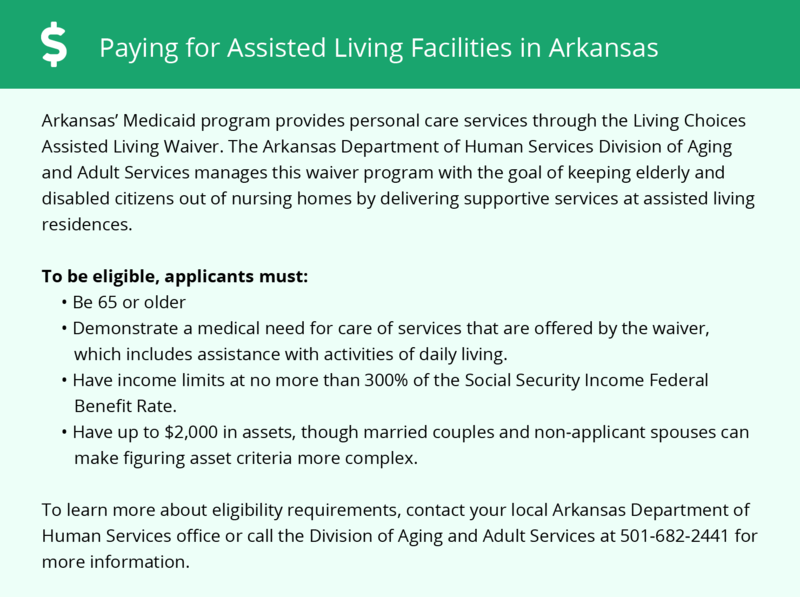 Visit our Memory Care in Arkansas page for more information about these laws.